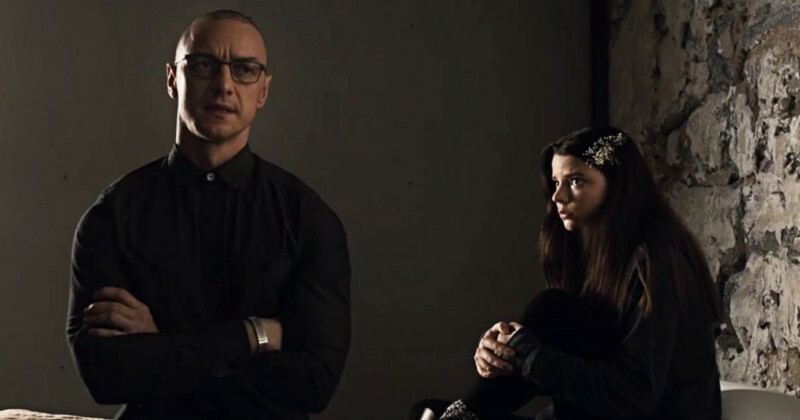 We Need To Talk About Split – dream a little bigger, darling. M. Night Shyamalan and I have always had a complicated viewer-filmmaker relationship. He directed three of my most beloved movies — Signs, The Sixth Sense, and Unbreakable, the latter an underrated masterpiece. He also made one of my most loathed, The Last Airbender, a tone-deaf white-washed adaptation of the stunningly progressive animated series of the same name, not to mention a run of uncharming B-movies. But it’s impossible to deny his talent for suspense, atmosphere, and emotionally satisfying genre payoffs (I even love the much-reviled The Village and argue it was ahead of its time), so I’ve spent years rooting for him to have a career renaissance. Looking at the reviews and box office numbers for Split, you’d think this is his long-overdue win. It isn’t. If you don’t know the story, here’s the Reader’s Digest version: a man with twenty-three different personalities (James McAvoy) abducts three teenage girls to serve as his food upon the impending arrival of his twenty-forth and final personality —a creature called the Beast, the pinnacle of human evolution. The girls try to escape; they fail; the Beast emerges and viciously cannibalizes lots of people. The end. I’d like to think how deplorably ableist the plot is doesn’t need to be explained, but here we are. Split posits a man with mental illness, specifically dissociative identity disorder, as violent, murderous, dangerous, and emotionally and physically abusive. That’s patently untrue. Because of the pervasive stigma surrounding mental illnesses, people with them are far, far, far many times more likely to have violence perpetrated upon them by others than ever commit acts of violence themselves. It may be a supernatural setting (biggest spoiler: it’s a sequel to Unbreakable, qualifying McAvoy’s character as a comic book villain), but furthering this stigmatization is unspeakably harmful and damaging. Killers with mental illness is hardly a new trope in the horror genre. That doesn’t make it acceptable. It’s past time to abandon those damaging cliches rather than advance them willy-nilly as a “scary” plot device without considering the real-life consequences they cause and the societal conditioning behind them. Media never exists in a vacuum. Roger Ebert described film as “a machine that generates empathy,” and because of the current political climate, now more than ever the industry has a moral responsibility to portray the misunderstood and marginalized with truthful inclusivity. What audiences consume has consequences. I’ve had two mental illnesses since I was at least thirteen. We’re not frightening, evil, unpredictable people. To add insult to injury, in a surprisingly female-dominated cast, three out of four die. Two of the young, conventionally attractive girls are brutally slaughtered, and all three are eventually stripped half-naked. Main character Casey (The Witch’s Anya Taylor-Joy in another stellar performance) is a deliberately classic Final Girl, but it’s hardly a satisfying example of triumphant empowerment. Casey escapes not through her own wit or stamina but because the Beast decides to spare her after seeing the scars covering her exposed torso. He views people who haven’t suffered as worthless husks, while those who have survived pain as better, higher beings than the rest of humanity (who deserve to be eaten). He declares Casey’s heart is “pure,” and she should “rejoice” in the strength her pain has granted her. I understand what Shyamalan’s trying to say. The Beast’s original personality, Kevin, is a survivor of parental childhood abuse, just like Casey — her guardian uncle has raped her since she was a child. The film ends with a wordless exchange between Casey and a female police officer indicating Casey intends to indite her uncle, but between the vilification of mental illness and the near-exploitative victimization of three different women who exist only to be victimized, Shyamalan’s themes are disastrously muddled and regressive. Not to mention the revelation of Casey’s molestation is played as one of his twist reveals, explaining away her authority-challenging, reticent introversion. It’s not a genuine, empathetic examination of trauma and recovery. I also have to address the stereotypical Good Girl/Bad Girl dichotomy at work. The Beast massacres Marcia (Jessica Sula) and Claire (Haley Lu Richardson) for being “impure,” and the movie seems to agree with him; in contrast to Casey, they wear skirts and crop tops and giggle about boys. Rather than highlighting different ways of performing femininity as positive, they’re eaten in punishment. Yet even that angle chokes on cognitive dissonance; Marcia and Claire are ready to fight for their lives and carry out two incredibly clever escape attempts. Are we supposed to see them as more than their initially (and unfairly) shallow, vapid presentations, and feel sorry for their tragedy? Or are we supposed to agree with the Beast’s moral judgments, given his merciful praise of Casey? The film never settles. There are two sole good elements to Split that make its flaws all the more infuriating. James McAvoy, whom I’ve loved since his Children of Dune days, delivers the defining performance of his career thus far. It’s the definition of a tour-de-force, deserving all the accolades the critics have showered upon him. He manages to create over a dozen entirely different characters and switch between them on a dime, often in one take, with just the most minute posture, body language, and facial changes, with absolute conviction. Even when they stereotype obsessive-compulsive disorder in the character of Dennis or put McAvoy in a skirt and high heels as Patricia (DEAR HOLLYWOOD THE TRANS COMMUNITY IS NOT CREEPY AND WRONG AND WEIRD oh my GOD how am I watching this), he doesn’t play the roles as ableist or transphobic. His excellence doesn’t excuse his taking the role nor elevate the material beyond its flaws (the transphobia, a clear homage to Psycho and played for the same shock value, is horrible), but the performance is terrifying and heartbreaking in one. Element two: from a purely technical standpoint, this is the best Shyamalan has been since Signs, maybe since Unbreakable. His innovative, daring camera angles evoke instant unease to reflect both situation and character. His knows when to hold his pacing to wind claustrophobic tension into terror, and when to edit breakneck speed. The music weaves in and out on waves of pulsing strings. He even makes the Beast climbing walls frightening instead of laughable. This is a master at work, and focusing all his talent on a project so ignorant is a waste. I enjoy, even love, plenty of films with deeply problematic elements that I nonetheless appreciate for their good qualities without forgiving or minimizing their flaws. This is not one of them. I can’t ignore damaging ableism, especially in our 2017 post-election landscape, for gorgeous aesthetics.